in B-flat Major, Op. 109 "Hammerklavier"
On Friday and Saturday, November 3rd and 4th, at 7:30pm, the Dance Department proudly presented its annual Fall performance of it Choreofest concert at White Recital Hall, within the Performing Arts Center, to a nearly full house. 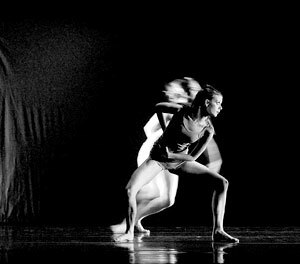 The annual Choreofest showcases faculty choreography, but the pieces are typically performed by the dance students themselves. This year's Choreofest, however, featured a student creation by invitation. The concert also featured a guest artist performing a solo piece. The show opened with a charming contemporary ballet, "Klavier Poems" choreographed by Paula Weber, which was last performed in 2003. Done to the music of Beethoven, the piece featured a male dancer partnering with a trio of females in a soft, sweetly sentimental suite. 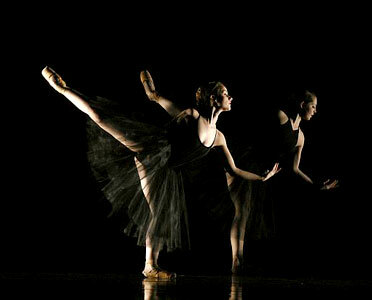 This ballet was elegant and attractive, yet challenging, which allowed students to grow and demonstrate their potential. "It was a very difficult piece, but I felt like these kids could master it," said Weber. "And they did... Both casts did very well... we did two casts so that both set of students could perform"
"The quality of the students we have now is fabulous," Weber added "They are very professional looking." 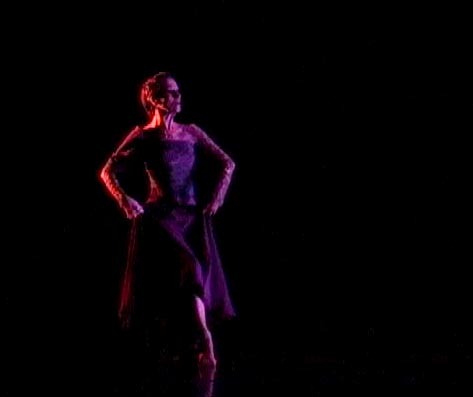 The next number was a dark and moody piece, "Courtesan", choreographed by Jennifer Medina. The piece featured guest artist, Christine O'Neal, performing a solo in a long purple, taffeta dress, which matched its dark countenance. This piece was a favorite of UMKC Dance alumnus, Katie Jenkins. "It was like mourning to music," said Jenkins. It was so heart-wrenching." Jenkins was also impressed with the rest of the concert. "The concert went really well," said Jenkins. "The versatility and diversity of the concert makes it very enjoyable... not only is the dancing good, but there was a demonstration of artistry too... not just mastery of skill... this shows that there is a wide range of talent in the Dance Department." The next piece was an all-female ensemble number, "Aspiring to Evolve", which was an invited student work, choreographed by dance students, Chelsie Danner and Stephanie Ruch. All nine dancers were dressed in white turtlenecks and split skirts, performing a barefoot Modern Dance piece with a very contemporary and timely feel to it. "This was my favorite piece," said dance senior, Anthony DeCarlis. "I loved the creativity of it." Next was an innovative piece, "Syn Shadow", created by Dance faculty member, Rodni Williams. He created a piece featuring an all-male ensemble, in several movements. 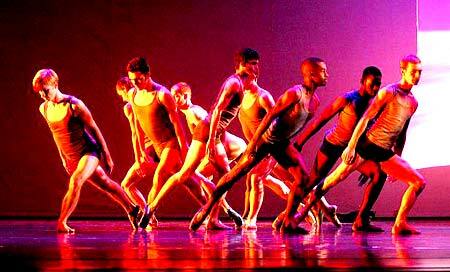 Edgy, yet hip, Williams stretched the boundaries of what people generally expect from male dancers in a concert piece like this one. The piece seemed very experimental, and featured an unusual segment where the male dancers sported a toe shoe on one foot. 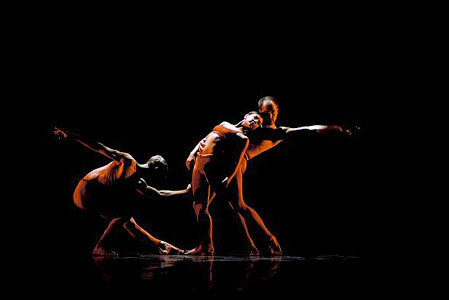 When asked about the impetus for the choreography, Williams responded that he does not examine the source of his inspiration, or question his muse. "I don't normally 'think' about the origin of my choreography," said Williams. "I don't know where the inspiration for a piece comes from.... I just let it flow out of me." Ron Belger, a junior in the Dance Department, found performing Williams' piece an education in itself, but an exciting one. "Rodni's piece was exciting to perform because of the storyline, which was unusual... and it was interesting to do because of working on pointe," said Belger. "Now I can understand more of what the girls go through working on pointe... it takes a lot of practice and control." Chris Page, also a Dance major, enjoyed the experience of performing this piece. "Rodni's piece went beautifully," said Page. "We were all working together as a unit... and it felt like the audience 'got' what we were trying to do." After the intermission, the show reopened with a lively and delightful suite of love songs, all in Spanish, that gave this contemporary ballet a decidedly Latin flair. The music was exquisite and the choreography stood up well to the music, matching both timbre and tone. Choreographed by Dance Director, Mary Pat Henry, this suite featured two different casts, one for Friday and the other for Saturday, and both performing well. "It is much more difficult training two different casts," said Henry. "But we wanted to be able to give more students the opportunity to perform more in the concert. 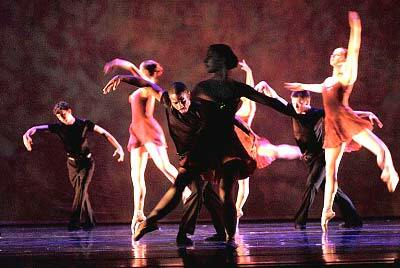 This suite was followed by "Infinite Pulse", which was choreographed by Sabrina Madison-Cannon. 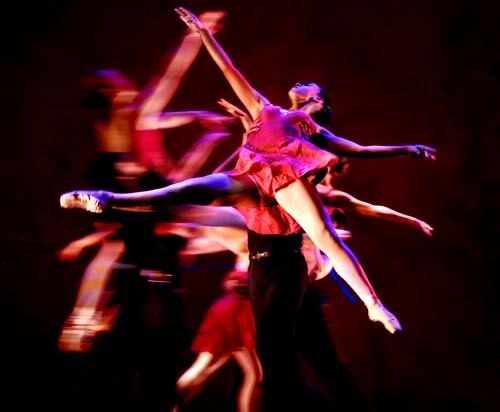 An excerpt from an earlier work, this piece feature a female partnering with two male dancers, in a terpsichorean ménage a' trois dressed in flesh-colored tights. Sensual and primal, this barefoot Modern Dance composition was a very dramatic piece that roused a thunderous applause from the audience. "This piece was an excerpt from a larger work that inspired by a text on relationship issues," said Madison-Cannon. "Particularly those that deal with power versus passion issues... such as those in a love triangle... and how we deal with those issues." Madison-Cannon was also pleased at how the students grew under her tutelage. "Yes, I am happy, pleased, proud, and overjoyed at the performances the students gave in the concert this year," she said. "And they grew so much in the process of learning the numbers... it is such a joy to see them come up to this level of performance." Next was a very abstract piece, which was choreographed by Jennifer Medina, and that started in complete silence. Movements were angular and uneven, and the dancers often doubled as scenery in this creative piece. The dancers floated rose-petals into the air at the piece's climax, representing pieces of the cosmos. "The rose petals represented the 'cosmic stuff' that makes up the universe, as well as all of us," said Medina. "The dance is about the interface between that which is human and that which is not human... creation and integration... we are all part of a greater whole." Medina was very pleased with how the number was performed by the students. "The dancers were beautiful, she said. "Everything went really well... even the fluttering of the rose petals." The closing suite also featured choreography by Jennifer Medina. "Grooveboxes" was performed by the entire ensemble, with females dressed in black tutus and males in black tights and red shirts. This energetic number was Medina's first foray into choreographing a pointe piece, and hopefully, will not be her last one. The piece closed the concert in thunderous applause. Even Randall Pembrook, Dean of the Conservatory of Music and Dance found the concert impressive. The entire concert can be described in one word: Amazing," said Pembrook. "The variety of performances in the concert was amazing... and the growth of the students is amazing to watch.... and the beauty of their dancing still continues to amaze me." "We are so proud at the Conservatory of the Dance Department and everything they have accomplished," added Pembrook. "And of their growth in not only the quantity, but the quality, of the Dance students."